The Hilton Garden Inn Bozeman hotel is located next door to Old Chicago Restaurant and the Bozeman Chamber of Commerce. The hotel is within walking distance to Bridger Peaks Towne Center, The Gap Factory Outlet, Pier One, Famous Footwear, Black House White Market, Chico's and Wasabi Restaurant. The hotel is only a short drive to the Montana State University campus and nine miles to the Bozeman Yellowstone International Airport which is served by several major airlines. Bridger Bowl Ski Area is only 18 miles North of Bozeman and Moonlight Basin and Big Sky Ski & Summer Resort are located 50 miles South of Bozeman with Yellowstone National Park only another 30 miles south of there. Bozeman Hilton Garden Inn features 123 guest rooms and suites, equipped with a spacious work desk with a comfortable Herman Miller ergonomic chair, complimentary wired and wireless high speed Internet access and a flat screen HDTV. A hospitality center in each room includes a microwave, refrigerator and coffeemaker. The room is also equipped with an iron/ironing board and hairdryer. The Business Center provides guests with complimentary use of 2 PCs, a fax and a printer available 24 hours a day. There is also an indoor pool, Jacuzzi, and fitness center also located within the hotel. The Garden Grille restaurant serves a delicious, all you can eat, breakfast buffet daily that is $9.95 per person and $3.95 for kids. Our Pavilion Pantry has a selection of refrigerated, frozen and microwavable packaged items perfect for in-room dining or our evening room service, from The Garden Grille, is also available daily. The Garden Grille is also open for dinner serving Beer and Wine. 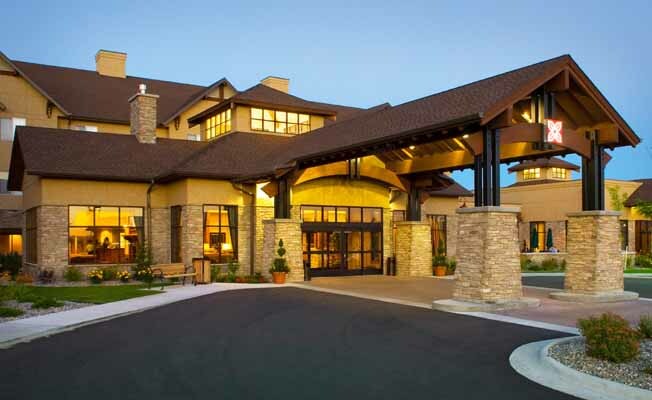 The Hilton Garden Inn Bozeman offers a total of 4,000 square feet of flexible meeting and banquet space. Our 3,375 square-foot Larkspur Ballroom, accommodates up to 220 people in a reception style setting. The hotel also includes our ballroom divisible into three medium-sized breakout rooms, our Goldenrod boardroom with seating for 12, a pre-function area and two outdoor patios. Catering for banquets, fine dining and receptions is available, including buffet style banquets or served dinners. Customized menus are available, compliments of our Executive Chef Todd Christensen, for those who desire vegetarian, vegan, kosher or allergy compatible meals.